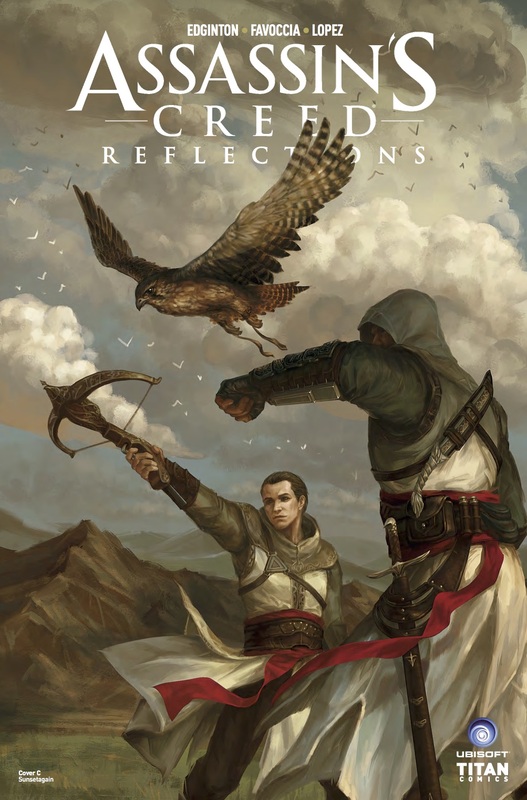 In the first issue of the new Assassin’s Creed: Reflections comic book series, we started with Master Templar Juhani Otso Berg going into the Animus for help. He started a journey researching famous assassins from the past, to try and understand the working of the assassin’s Brotherhood from the inside, in order to defeat them. As he quotes “to truly know one’s enemy is to become him”. We travelled to Italy last time and once more saw the great assassin Ezio. We witnessed a tale involving the Mona Lisa painting and Leonardo da Vinci. It was fun, well written and action packed. Can the next issue live up to the first? story then focuses on action sequences and how the plan works itself out. 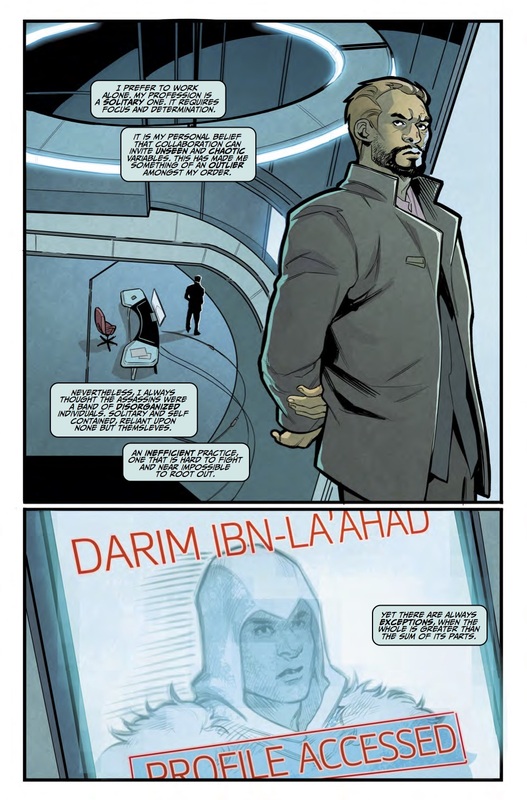 The POV changes from Darim to Altair throughout the narrative until the final conclusion. We finish back with Berg who has learnt another useful lesson about the Assassins. Like the last issue, the setup in the structure is the same as before, but it’s a setup that works brilliantly. 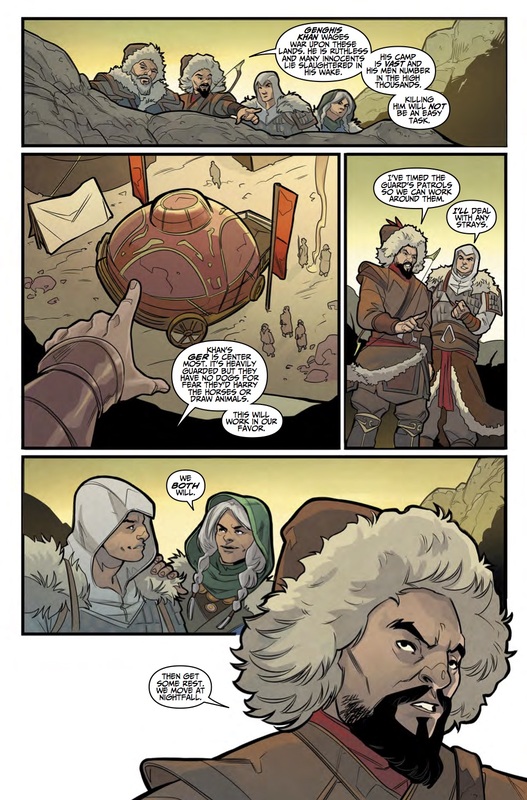 I am really enjoying this glimpse into the Assassin’s Creed universe, with the focus of the overall narrative being the Grand Master Templar’s discoveries. The action sequences are once again exciting and solid, with great tension building and story development. The characters are very well defined, even though at times I had trouble working out exactly who was who. It sets up the possibilities for many more stories in this series, across many different timelines. I do hope that the Grand Master’s story arc moves on significantly in the next few episodes, so he’s not just watching bits of the past and commenting on them. What’s his plan? How does this help? Two questions I’m sure will be answered shortly. The dialogue is wonderful as well, brimming with wit and energy. The artwork in Reflections #2 is full of life again, with some beautiful shading and colouring. The frame design and storyboarding is excellent, particularly the focus on the action scenes, which once again are thrilling and detailed. The characters’ facial expressions are superb and the drawing of body shapes is great. There has been some work with a historian working on this issue and you can tell in the amount of detail on the costume, hair and sets. Also, the way the West China story ends is based on the actual rumours from the time regarding Genghis Khan and his story. Overall, the second issue builds very well on the success on the first. The story and plot is thrilling and action packed, with the China line and the promise of more stories to come throughout the whole timeline of the Assassin’s Creed universe. Hopefully the main story arc with the grand Templar will progress and develop more in latter issues. The artwork is superb and well drawn, with excellent framing and amazing historical detail. So another great story is this exciting series, and I am left waiting and wondering, with excitement, where we will go next in time. Next article10 more arrivals hit home with Xbox One Backwards Compatibility – Are they worth the return?